Rabbi Michael Cahana addresses an audience on marriage at St. Mary Cathedral while Msgr. Patrick Brennan and Rev. Nathan LeRud listen. The three faith leaders discussed their traditions’ teachings on marriage. A rabbi, a Catholic monsignor and an Episcopalian priest can agree: marriage is God’s wonderful design. But the way humans carry it out sometimes is daunting. “Some marriages are made in heaven. 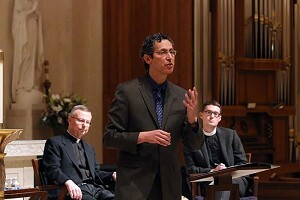 Some are made somewhere else,” Rabbi Michael Cahana said Feb. 3 during an annual Portland tri-faith talk, held this year at St. Mary Cathedral. Rabbi Cahana, Msgr. Patrick Brennan of St. Mary’s, and the Rev. Nathan LeRud of Trinity Episcopal shared their traditions’ teachings on matrimony, divorce and remarriage. “Marriage is not to be just about finances or protecting the kids. There should be an ideal of holiness in the marriage,” Rabbi Cahana told the interfaith audience. He said some Jewish scholars say creation stories in Genesis imply that the first humans were androgynous and then divided into male and female. The Jew, then, is to seek a spouse that completes him or her. As among Catholics, Jews see marriage as both for procreation and unification and benefit of the couple. Unlike Catholics, Reformed Jews like Rabbi Cahana accept civil divorce as valid. Msgr. Brennan, who oversees the Archdiocese of Portland office that reviews requests for annulment declarations, spoke about the Catholic belief that marriage is a sacrament and a covenant that, as Jesus himself said, no one can break apart. Msgr. Brennan said a civil divorce has no power to dissolve a marriage. That’s why the church takes time and effort to investigate when someone who has been divorced wants to wed again in the church. Msgr. Brennan cleared up a common misunderstanding — a divorced Catholic can still be in good standing and receive Communion — unless he or she attempts re-marriage without an annulment. Pope Francis, Msgr. Brennan said, has made it clear that all people should feel welcome in the Catholic Church, including people who are divorced, remarried or homosexual. Msgr. Brennan says it’s possible that the annulment process will be simplified and shortened in the near future. Rev. LeRud says much of the discussion among Anglicans on marriage concerns opening it up to gays and lesbians. That has prompted a larger debate about the meaning of matrimony itself. “There is lots in play for Episcopalians on marriage,” Rev. LeRud said.